Where did Wassily Kandinsky grow up? 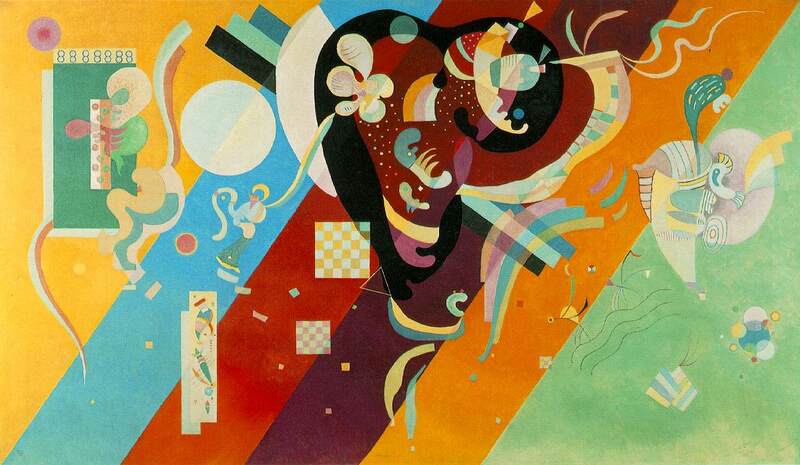 Wassily Kandinsky was born in Moscow, Russia on December 16, 1866. He grew up in the Russian city of Odessa where he enjoyed music and learned to play the piano and the cello. Kandinsky would remark later that, even as a child, the colors of nature dazzled him. Both music and colors would have a huge impact on his art later in life. Kandinsky went to college and then became a law teacher. However, when he was thirty he decided to change careers and become an artist. He attended art school at Munich, Germany. Early on his art was influenced by painters like Claude Monet as well as music composers and philosophers. Kandinsky's early paintings were landscapes that were heavily influenced by Impressionist artists as well as Pointillism and Fauvism. The most famous of his early works is The Blue Rider which he painted in 1903. About 1909 Kandinsky began to think that painting didn't need a particular subject, but that shapes and colors alone could be art. Over the next several years he would start to paint what would become known as Abstract Art. 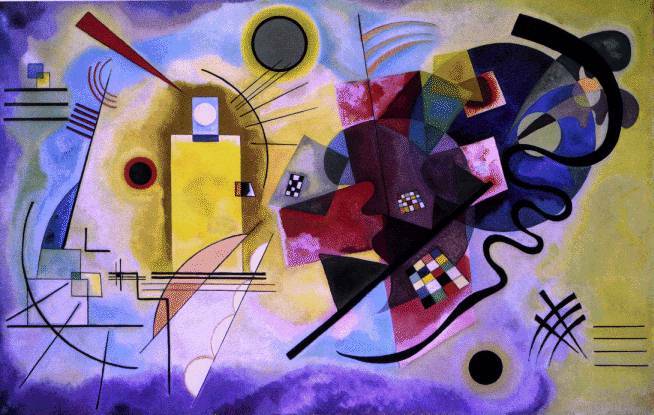 Kandinsky was one of the founding fathers of Abstract Art. 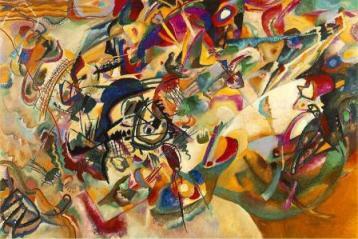 Kandinsky felt that he could express feelings and music through colors and shapes in his paintings. For example, he thought that yellow had the crisp sound of a brass trumpet and that certain colors placed together could harmonize like chords on a piano. The shapes he was most interested in were the circle, triangle, and the square. He thought the triangle would cause aggressive feelings, the square calm feelings, and the circle spiritual feelings. While refining his art and ideas over the next several years, Kandinsky took on different positions and moved around some. From 1914 to 1921 he returned to Russia. During this time he married his wife Nina. When his art was rejected in Russia he moved back to Germany to teach at an art school called the Bauhaus. He left Germany in 1934 because of the Nazis and moved to Paris where he lived until his death in 1944. 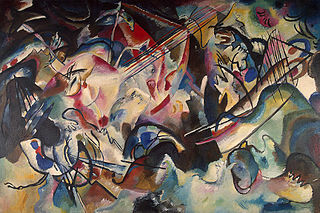 This painting is an example of Kandinsky's Abstract Expressionist art. He planned the painting for six months and wanted it to represent a number of feelings including flood, baptism, destruction, and rebirth. When he finally went to paint he was blocked and could not paint. He finally resorted to repeating the word "flood" over and over again and began to paint. He finished the painting in three days. In 1911 he wrote an essay called Concerning the Spiritual in Art. He described three types of paintings including "impressions", "improvisations", and "compositions". Many of his paintings were named using these titles and a number. 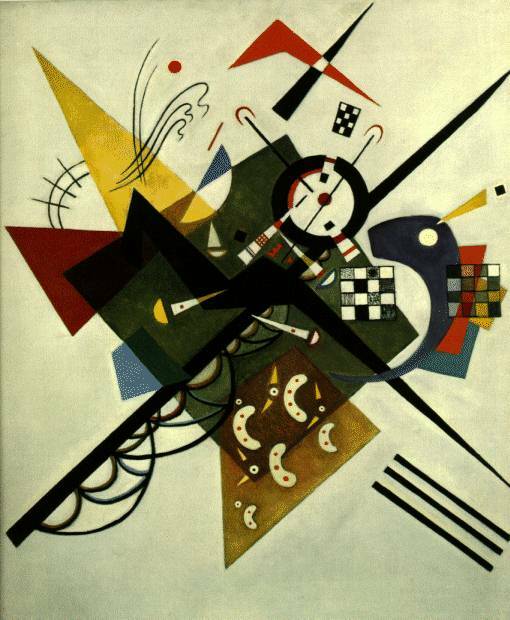 Some examples of this include the paintings Composition X and Impression V.
If Kandinsky wasn't the first abstract artist, he certainly was one of the founding fathers of the art form. His art and essays on art have had influence over many artists during the last century. Many of his paintings used names as if they were songs or musical works like Composition and Improvisation. The Blue Rider was also the name of a group of expressionist artists including Kandinsky, Paul Klee, Franz Marc, and others. They had their own exhibitions and wrote an almanac that included essays on art theory. He once said that "Everything starts with a dot". About abstract art he said that "the more frightening the world becomes…the more art becomes abstract". He named the paintings he considered the most accomplished "Composition". He only named ten of his paintings this way.